The Parker Solar probe will launch soon, and over a period of years and several planetary flyby's loose enough energy from its heliocentric orbit to reach an orbit with a perhihelion of only about 4 million km. The Spacecoast Daily article Traveling to the Sun: NASA Describes ‘Why Parker Solar Probe Won’t Melt?’ links to the video Blowtorch vs Heat Shield which shows only dark carbon-like materials, but in the video Why Won't it Melt? How NASA's Solar Probe will Survive the Sun the surface of the heat shield is white, as it is in the photo below. What material will make up the surface of Parker's heat shield that faces the sun, and what is its reflectivity in visible and near IR wavelengths where most of the Sun's intensity falls? More about the heat shield in this answer. This was difficult to answer until I figured out that this mission used to be called "Solar Probe Plus" and all the early studies were done under that name. generally provide the optical characteristics compatible with the proposed shield passive thermal management strategy. These characteristics are low solar absorptivity and high IR emissivity. Thermodynamic stability and chemical compatibility with C-C are additional differentiators that further narrow the list of candidate ceramics. At the end of the study, both aluminum oxide (Al2O3), commonly called alumina, and pyrolytic boron nitride (PBN) were found to notionally satisfy these basic characteristics. 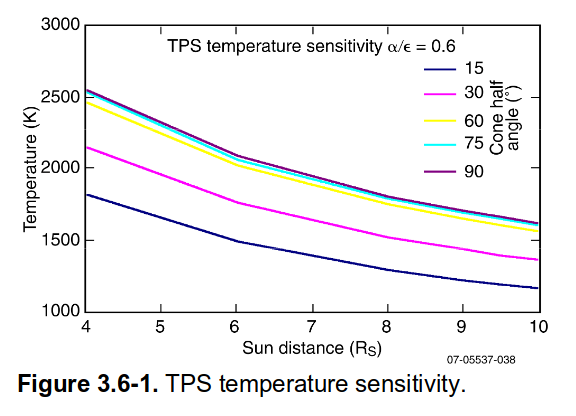 The key optical property is the ratio of the solar absorptance to the IR emissivity, α / ε , set at the design value of 0.6 in Figure 3.6-1, which shows that the shield temperatures are reduced as the Sun distance increases or the cone angle is decreased. The baseline coating for the Solar Probe primary shield (without modifications such as doping) is a thin (100 − 125 μm) coating of alumina (Al2O3) on a C-C composite. Some articles about the mission state that this coating was applied via plasma spray, this news article appears to confirm that. 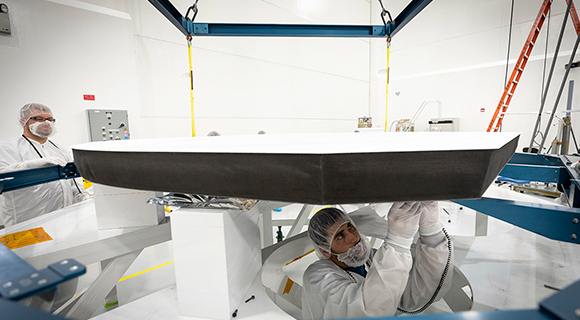 The white coating on the front of the heat shield, the part that will face the Sun, was sprayed on by Plasma Processes, Inc. in Huntsville, Alabama. Not the answer you're looking for? Browse other questions tagged heat-shield parker-solar-probe .